Nobody plans for a divorce. Nobody plans to spend thousands of dollars and years of his or her life fighting with the people he or she once loved. At Baker and Baker, we understand that this is a stressful time for you, and that it can be difficult to separate emotions from practical realities. That’s why we believe in guiding you through your legal matters as efficiently and effectively as possible, and why we use our experience and skills to find you solutions that will save you time, money and a great deal of trouble. With 75 years of combined experience, we are in a strong position to help you. Our lawyers have a wide range of backgrounds, including experience in mediation as well as complex matters of custody, support, professional practice and business valuations, and complex tax and pension matters. We offer a free half-hour consultation, often with our most senior lawyer, who will use his 35 years of experience for your benefit. Once we have answered your family law questions, we will talk about your situation and give you our opinion about your case. Start with mediation, as this is generally far less expensive and time-consuming than any other process, and helps protect your children and your family from needless conflict. Try to settle as many of the issues between you and the other party as possible. If mediation doesn’t work, hire lawyers who can help you negotiate a solution. As a last resort, go to court. Our office is conveniently located in the Yonge and St. Clair area in Toronto, Ontario; four blocks south of St. Clair at Woodlawn and two blocks north of Summerhill subway station. We also speak French and Italian in the office. Let us help you put this part of your life behind you. 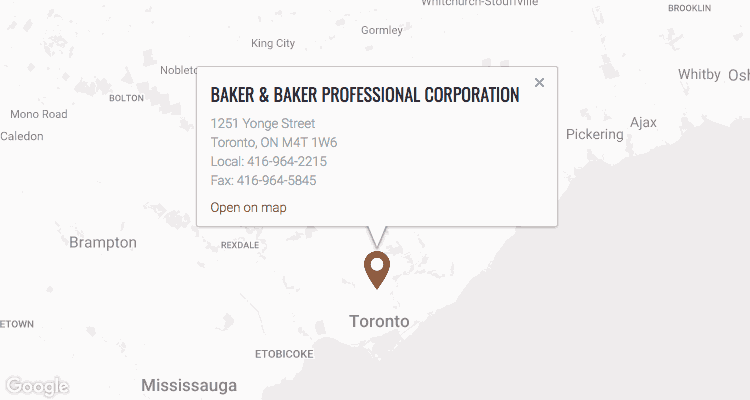 Contact Baker & Baker at 416-964-2215 or by email to set up a free consultation and learn more about your options.